Naruto (鳴門市, Naruto-shi) is a Japanese city in Tokushima Prefecture on the island of Shikoku. 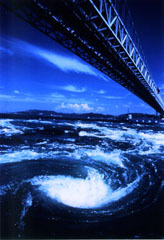 One of the famous attractions is the Naruto whirlpools between Naruto and Awaji Island in the Seto Inland Sea. Naruto has the home stadium of professional soccer team Tokushima Vortis. ↑ 1.0 1.1 Nussbaum, Louis-Frédéric. (2005). "Naruto Kaikyō" in Japan Encyclopedia, p. 700. ↑ Soccerway.com, "Tokushima Vortis"; retrieved 2012-9-21.